One thing the world's population has had in common during the past 10,000 plus years, is it's use of various products to enhance the appearance of the skin and face. Whether this means employing oils and creams to improve complexion, using dyes and kohl for the eyes, or the ceremonial application of clays and henna, cosmetics have held a popular, meaningful place in countless societies for thousands of years-and that's not likely to change anytime soon. But like any makeup-wearing entrepreneur, fitness guru, or super mom can tell you, wearing makeup in hot, humid climates is not easy. That is unless the makeup in question is designed to stand up to the heat, like the products created by RIMIX Cosmetics. 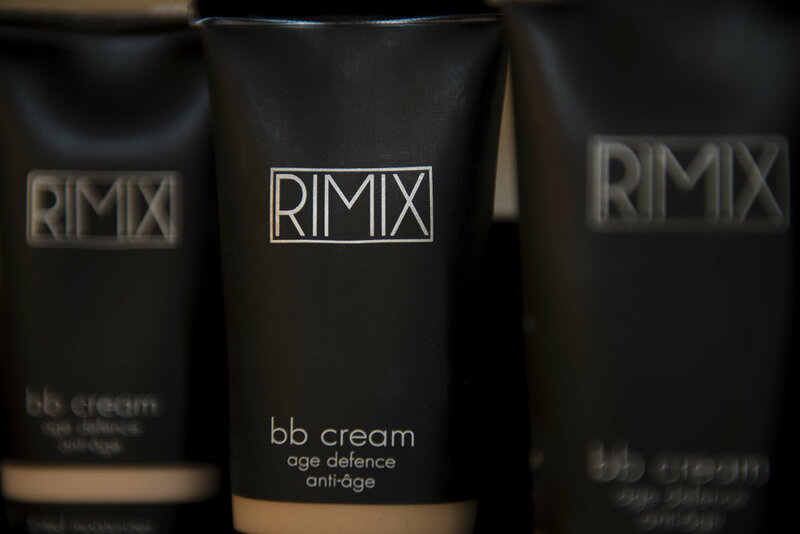 RIMIX founder, Rianna Alberty, describes the brand as, "A luxury performance line of cosmetics and skincare. We offer heat-resistant and sweat proof makeup that is made to stand up to the Texas heat. All of our products are non-comedogenic, paraben-free, cruelty-free and hypoallergenic." Most of us have probably never heard the term non-comedogenic before. It means that a product has been specially formulated to avoid blocking the pores, and that means that RIMIX has changed the game. When interviewing entrepreneurs, we often find that the old saying about necessity being the mother of invention bears out. This was also the case with Rianna. "When I was teaching Pilates I had trouble with my makeup staying in place during class. I wasn't wearing a lot of makeup, but I wanted to look presentable in my classes. I started trying a bunch of different lines and might find one good product out of each, but I couldn't find a product line that was great across the board. I felt there should be something on the market that made people feel safe to sweat in it, even if they were walking outside. As a Pilates instructor, I had a specific use--but we all sweat outside in this climate. So a line like this appeals to a lot of different people." Wanting a consistent, high-quality, heat-resistant makeup line is one thing, actually designing your own luxury brand of cosmetics is another, but it's a challenge that Rianna was made for. "My dad always worked for himself and always worked really hard. I remember him constantly having business and product ideas. I know I got a lot of that from him. I always come up with business ideas. That's just how I've been since I can remember. I was probably eight when I had my first business idea about somehow mass producing mixed tapes, back in the day when we recorded songs off the radio." While a variety of different creative endeavors appealed to Rianna, makeup was the most natural draw. "If you asked my mom, she would tell you I never leave the house without makeup on, ever. And I was always drawing and shading and doing gradients, which is essentially blending, and is an ideal skill for a makeup artist." Few entrepreneurs start their business without some other experience under their belt. For Rianna, her pre-RIMIX career began when she got a job with a handbag company after finishing her business studies. Later, she decided to embrace her creativity by moving to Europe and becoming a makeup artist, working her blending magic on models walking the runway at London's Fashion Week. "I see color really well. I have gotten to a point now, after doing makeup for so long, that I can match a foundation pretty accurately without effort. That's a fantastic skill for a makeup artist to achieve. My time at London Fashion Week was hugely inspirational. That was the most creative work I've ever experienced. Even though I was applying makeup that someone else designed, it was the most out-of-the-box, creative and challenging career highlight. I grew by leaps and bounds and came back three notches higher as a makeup artist than when I left." The jump from makeup artist to manufacturer isn't all that simple, though. "It was a ton of research, and that's why it took me three years. I spent a full year just researching laboratories, ingredients, and testing makeup." At some point, the development and testing phase is over, and it's time to launch. It can be tricky for entrepreneurs to determine the best time to do that, but for Rianna, that moment was obvious. "I was at my house and I had been testing our product line that I had high hopes for. Makeup is funny-you can't just put it on and decide it's great. If you're testing a product, you have to wear it. You have to go out in it. You have to go do different things. You have to look at it in your rearview mirror in the natural light. You have to wear it, and play with it and put it on a few times. After about the third or fourth day of wearing our product, I thought 'Why isn't anyone else doing this? I have to get this out to the world.' That was the moment I knew it was going to happen. It was full speed after that." Like many businesses today, RIMIX Cosmetics got its start online. "Because I started very lean, I had to launch online first. A short six months after I launched the business, I was in the right place at the right time and got the opportunity to rent a space inside of a very large salon on West 6th Street. That was probably one of the best things that happened to us last year, to get our brand in front of a very large segment of our audience. The convenience purchase is high at the salon because there is so much foot traffic built-into the space." If you ask Rianna what her biggest mistake has been in this process, she'll tell you what many entrepreneurs have said in the past: she should have outsourced the RIMIX Cosmetics accounting sooner. "I didn't hire a bookkeeper and accountant until my second year in business. If I had to do that over again, I would have hired them earlier because it would have given us a lot more insight, organization, and data." even more insight to share to those who would follow in her entrepreneurial footsteps. "The best advice that I received was to find someone who is doing what you're doing and simply ask them for help. You'd be surprised how open people are if you just ask them. You can also get involved with a group or network through Meetup. It doesn't cost very much and you can find a ton of people that are trying to do the same thing as you." Lastly, Rianna says entrepreneurs need to do their research. "Do as much research as you can. The more informed you are, the more decisions you can make that are going to be in your best interests." And the research doesn't end once you open your business's brick-and-mortar or virtual doors. Right now, Rianna is researching her company's next big thing­skincare. Through her business, Rianna has found the perfect channels for her ambition and creativity, but the greatest pleasure for her is what her makeup and skincare line does for others. "I think one of the best parts of my job is that I get to help people present their best side and their best self every day. I put makeup on at least one customer each day. That person comes in and tells me what they don't necessarily love about their face and what they do love about it, and I'm able to help them de-emphasize the things they don't love and highlight the things that they do love. Every time this happens, the customer can't stop raving about how great they look. They're smiling and they're happy, and that means so much to me. There are hundreds of apps and sites that help you filter and edit pictures, but I get to do that in real life with people-helping them gain the confidence they maybe didn't have before. I feel lucky that I get to do that." Check out this line of high-performance cosmetics online at rimixcosmetics.com or in person at Bella Salon on West 6th in downtown Austin.